if you want to see where from your employees punch in/out, you should set it in the labor contract of those employees. Go to settings -> contracts, click edit on the appropriate contract / go to users, find the appropriate employee, click on edit, scroll to “Salary info”, if there is a contract selected, click on “edit this contract”, if not, it means that the employee uses the default contract, you can choose it in the drop down and then click on “edit this contract”. 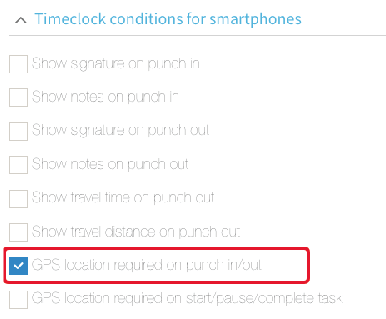 Scroll down to “Timeclock conditions for smartphones”, check or uncheck the “GPS location required on punch in/out”, then click “save”. * If the employee already installed the mobile app and you want him to send location on punch in/out, he should go to Timeclock 365 app , tap on menu -> settings and tap on “update settings” button.